Mariah is this very sweet cat around 5 years young. She loves to sleep right by your head and purr you to sleep. Mariah was rescued from the streets of Waterbury CT where she was hungry and searching for food. We saw her in the distance climbing through brush, she was painfully thin but had a large belly. We assumed she was pregnant and moved quickly to get her to safety. She was friendly, just another sweet cat that was dumped to survive on her own. We took her to the vet and to our surprise she was not pregnant but had a life threatening Uterine infection called Pyometra she was rushed into surgery. The vets said it was the worst case they had seen and she would not have lived another day or two if she had not been rescued. 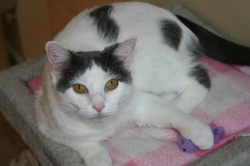 Mariah recovered beautifully from her ordeal and was placed in foster care. Several months later she seemed to be losing weight and feeling poorly. Blood tests revealed that she now had Hyperthyroidism. In some cats this problem can be treated well with medication. We put her on a daily pill but she did not respond well. The medication made her lethargic and sad and she continues to lose weight. Without the medication the condition puts a lot of strain on her heart and will eventually kill her. The good news is: there is a cure for Hyperthyroidism!! It's called radioiodine therapy. It's and injection in the thyroid area that kills the tumors that cause this disease. On the site radiocat.com you can read the explanation and the details of this treatment. Because of her poor reaction to the medication this treatment is her only hope. Without it we will need to make the hard decision of putting her to sleep. Sweet Mariah doesn't have much time, the longer we wait the more damage to her heart. Radioiodine therapy is simple but expensive. We need $1500 to give her the cure and restore her quality of life. And she, like every cat, is worth it.